Amsterdam International Airport (Schiphol), the only airport in Amsterdam, is one of Europe's busiest hubs. Schiphol Airport Amsterdam has a reputation for efficiency and good facilities. There are hotels behind passport control, so you can board your plane 30 mins. after you got up, and Amsterdam airport transfers are very efficient since the trains to the Amsterdam city center stop immediately below the main terminal. This page alphabetically lists the most important (and fun) facilities. Also be sure to read our introduction page about Amsterdam Airport. Current flight information (including delays) is on the Schiphol Airport's website. You can also get this information (as well as other information) by phoning +31-(0)900-0141 (0.40 euro/min in the Netherlands). Short-term parking (30 minutes to 2 days) is possible on the P1 and P2 car parks, close to the airport terminal (Schiphol Plaza). are signs from the A4 motorway. It's not cheap: 2 euros per 30 minutes, or 32.50 euros for each 24 hours. Long-term parking (over 2 days) is to be done on the P3 car park, elsewhere at the airport terrain. Every 10 minutes, a shuttle bus leaves from there to the airport's terminal which takes 10 minutes. Costs are 50.00 euros up to 72 hours, and 6.50 for each subsequent 24 hous. There's also Valet Parking, meaning you park you car right at the entrance and hand out the keys. Someone else will park your car for you, and upon return the car is again at the entrance. See our special page about Amsterdam airport transfers for the cheapest and quickest ways to get from Amsterdam International Airport to the city center. Collecting passengers is done by parking your vehicle at P1 or P2 (see above) and going to Arrivals 1, 2 or 3 (TV screens in the terminal tell you which one is correct). If you're dropping off passengers by car, you can do so right at the entrance. Only brief stops are allowed here. Just follow the signs 'Departures' from the A4 motorway. If you also want to see your passengers off, you must also park in P1 or P2. Parking at the Departure and Arrival Passage is not allowed. Six car rental companies have offices at Schiphol Plaza (the main terminal): Avis, Budget, Hertz, Europcar, National and Sixt. If you're over 18 and are able to show a boarding pass and identification, you can operate slot machines or play roulette and black jack at the Holland Casino (owned by the Dutch state). It's located behind passport control at the E/F gate from 6.30am to 7.30pm. Amsterdam International Airport has several children's playing areas with slides, carts, Nintendo computers, Lego and video screens. They are located between piers E and F, and open from 6am to 22pm. But as they are not supervised, you are responsible for you own children. At the Holland Boulevard (between Lounges 1 and 2), there's also a babycare lounge. It's open daily from 6am to 10pm. Furthermore, McDonalds (Lounge 2, Foodcourt) has a playing area with apparatus and toys. Amsterdam International Airport's frequent flyer club is Privium. Various levels of membership is open for anyone upon payment of a yearly fee. Depending on the membership level, benefits include fast border passage through an iris scan, priority parking, business-class check in and, in the near future, access to the luxury Privium ClubLounge at the airport. The airport has too many bars, cafés, restaurants and hotels to mention them all. A few noteworthy ones are mentioned on our other Amsterdam Airport page. In case you're wondering, there are also 2 hotels located behind passport control, of which one (Yotel) also rents room by the hour. There's wireless Internet (Wireless LAN) at the airport. Just turn on your laptop or PDA, open your Internet browser and follow the directions on your screen. It's a paid service, though - you can pay online or you can buy an access code at one of the KPN Internet Zones or one of the pay points. There's a 24/7 helpdesk: call +31 20 6531852. At several spots on Amsterdam International Airport, there are Lazy Chairs and Relaxation Chairs - perfect for those that could use a little rest. At the XpresSpa, you can get massages, facials, deep tissue treatments, pedicure and more. It also has quick programs for passengers with little time, and a reservation is not necessary. Location: behind passport control at Departure Lounge 2, opening times: daily from 7am to 8pm. The other massage saloon, Back To Life, also offers aqua massages without getting wet, or quick chair massages starting from 10 minutes. The Powernap-dome is apparently quite an experience. Location: Lounge 1, opening hours: 8.30am to 7pm. You can get a refreshing foot bath at the foot shower, of Schiphol's best kept secret. It's located at the second floor just behind the meditation center. Airport Medical Services is the medical office at the airport, providing first aid, vaccinations, medical transportation, advice, ambulances and more. It's open 24/7 at Depatures 2, above check-in desk 16. An appointment is not necessary. Phone: +31 20 6492566. Amsterdam International Airport has several ATMs (in Dutch: "geldautomaat"). Most accept credit cards such as Visa and MasterCard/EuroCard, and other cash cards that depict the Maestro, Cirrus or Plus logos. You do need your PIN code for that. ATMs usually have an English language button. Changing money is best done at one of the two GWK Travelex offices at the airport. There are offices at Schiphol Plaza (before passport control) and Lounge 1 (after passport control). ABN Amro also has several money changing offices. 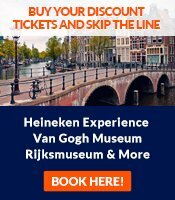 The Rijksmuseum, the national museum of the Netherlands, has a special permanent art collection at Amsterdam International Airport. Access is free. It's located behind passport control, between piers E and F.
See our other Amsterdam Airport page. It's even possible to get married at Amsterdam International Airport. There are several packages, each with their own venue. More information: www.schipholweddings.nl.